Hello Kitty is never super straightforward about her presence. She’s always kind of peeking around a corner. She’s a lurker. Even in my baked cupcakes. Vividly recalled the orphans in Miri love this so much especially girls. Wonder how are they now. By using freehand to roll this fondant Hello Kitty Face without any Hello Kitty's cookie cutter, roll some white prepared fondant out to a 1/8 inch thickness. Roll the fondant into round shape as Hello Kitty head shapes and make 2 little ears on top of it. 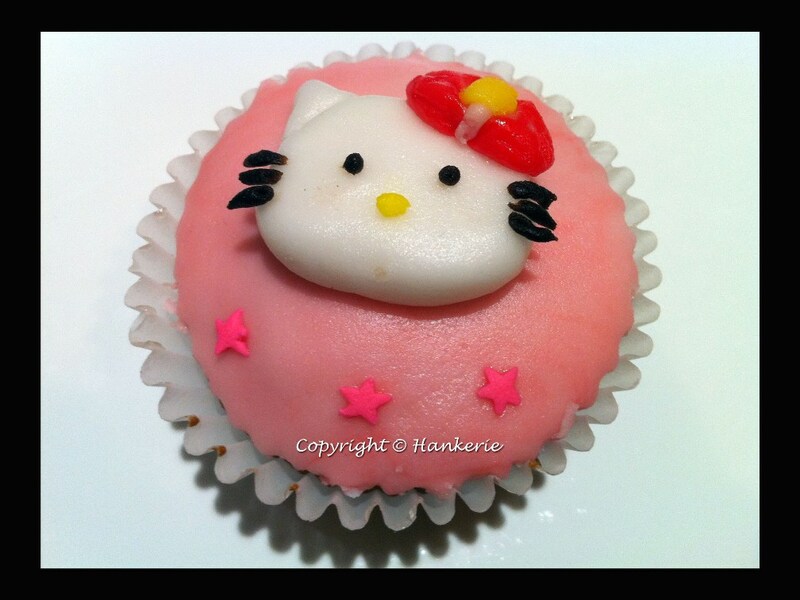 Use black frosting in a pastry bag to pipe on Hello Kitty's eyes and whiskers. Add yellow colour fondant as her nose and make her bow over her right ear. More fondant entries coming soon in next few days. Stay tune and check out my blog later. Loved your hello kitty cupcake, so cute!